Bridal makeup is the daily bread of most makeup artists. 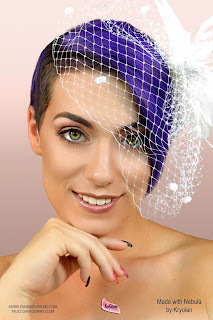 Brides to be of any ethnicity and tradition tend to agree on three key factors when discussing their makeup: durability, coverage and perfect finish. Airbrush makeup is the perfect answer to these expectations, and it adds speed, hygene and high HD performance to boot. 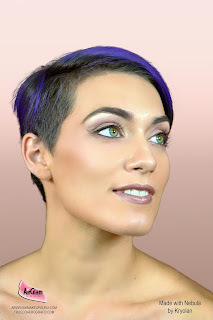 The new Nebula line by Kryolan features a wide range of colors designed to perform well for any makeup goal, from invisible coverage to body painting, however because of their finish and their resistance we found it ideal for bridal makeup, and we produced the enclosed video tutorial to demonstrate just that. The Nebula formula is silicone based, which makes the product comfortable, allows great coverage and makes it water proof. 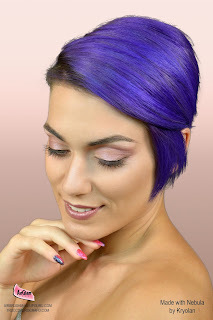 Unlike many airbrushable silicone based products however, Nebula has a very low viscosity and a very short drying time which is comparable to that of water based products. The final finish is also very light, luminous but not shiny and very effective in its coverage. In other words, it is exactly what brides are looking for. We already discussed our first impression of this product last week. After experimenting some more with these colors I can confirm that they do have a learning curve, and that the results you get will improve more and more as you practice applying them. Of course they were conceived for airbrush application, and I hope that this will inspire more and more artists to learn this incredible technique, forgetting all the fears and false myth that still surround it, and that were spread mostly by those who don't really know how to use it. For those of you who are in fact considering adding this skill to their abilities, I will now review Kryolan's own airbrush kit. Please keep in mind however that Nebula will work on any professional airbrush kit regardless of the brand. 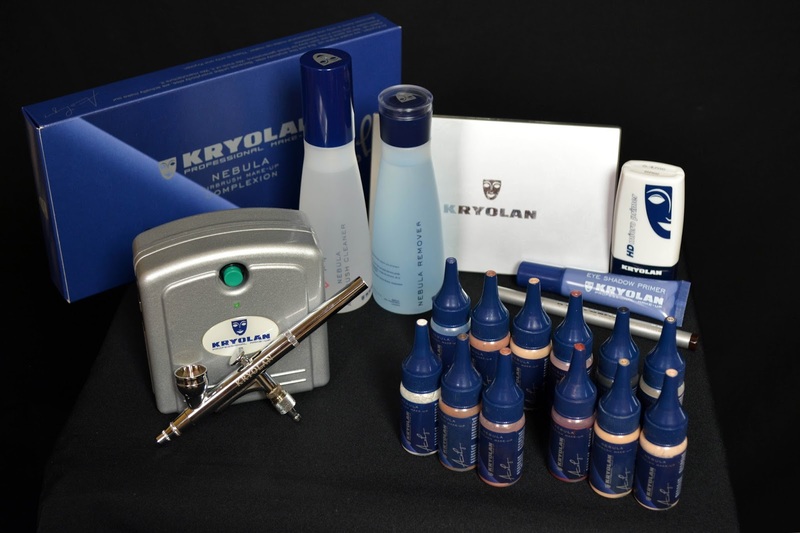 Kryolan chose a great maker for the kits it distributes. These are made in fact by the Taiwanese historical Sparmax brand, which also provides tools for most of the best airbrush brands in the world. The compressor chosen by Kryolan is the very reliable DAC 25, a true work horse among portable units. This little jewel is very quiet, very light and compact and quite powerful with an air stream output of 30 PSI. The version manufactured for Kryolan has an appealing silver-gray finish that makes it also very attractive to look at. The compressor comes with a rechargeable battery pack, and can be carried on the shoulder or attached to your belt thanks to a very practical and slick bag. The carrier bag feature an exra compartment for an additional optional battery pack which will give you twice the amount of time without having to plug in the unit. A single battery pack in any case will be enough to complete a whole beauty makeup and more. The airbrush included with the version of the kit that I purchased is another work horse in the airbrush makeup world, that is the Sparmax SP35 with its solid reliability and high quality, easy to replace components. With the launch of the Nebula line Kryolan started distributing an additional airbrush with a slightly bigger nozzle (0.4mm) in order to allow for the optimal flow of shimmery pigments. This is good but not strictly necessary, as the product will work well on smaller nozzles too. For our video shoot I have replaced the valve on my airbrush with a continuous airflow valve (often called "single action"), and I added a pressure regulator which at this time does not come with the standard kit. Doing this will make application on smaller, more delicate areas such as the eyes much easier, and will allow you greater control of the product, however these tweaks are not indispensable. To make the cleaning process easier, Kryolan has created a specific Nebula Airbrush Cleaner. This is truly an excellent product that will allow you to clean and flush out your airbrush very easily and very fast, even if you use it in between colors. Cleaning at color changes in any case will only be necessary if you are switching to a much lighter shade or between very pigmented colors. In my not exactly limited experience I can attest that thanks to this cleaner Nebula is the silicone based product that is easiest to clean, bar none. Another effective product is the Nebula Remover, the makeup removing solution created specifically for this makeup. The very resistant Nebula colors can be removed also with any good silicone based makeup remover, but none will be faster and gentler than this. The makeup shown in our video tutorial was made entirely by airbrush, except for eyeliner, mascara and lipstick. No brushes, HD powder or fixing sprays were used. The skin was prepped with silicon based Kryolan primers. The cuts in the filming are purely for timing, we have not touched up the makeup "off camera" in any way. Our model survived the water test and went on to wear the makeup for the rest of the day. She confirmed it held perfectly until it was removed. The airbrush makeup I have already (one of the brands listed but i won’t say which one) cracks under the eyes and chin areas after about an hour of wear, it’s also listed as waterproof yet washes off if i run it under water without even rubbing it... I see that this one is waterproof but does it crack after its worn for a while? I have tried so many different kinds. I so desperately want to offer airbrush to my brides but I have put so much money into finding a brand that stays as well as regular foundation... please help!